Well, it’s April again, and it has been very, very windy. Sunday Stu and I were discussing whether the way Quigley was sort of closing his left eye while he watched us eat, and pretended to doze, meant anything. Monday evening, as I was preparing to go out for our walk, the light was just right as Quig came up to me and I saw a bump on his cornea with a little blood vessel-looking thing snaking out to it. Later, Stu examined him with a strong light and said it looked like some sort of reddish covering. So this morning I called the Vet Specialists, with visions of surgery, a two-week recovery, and an e-collar dancing in my head. I took him in at 9:15 and… as usual, my speculations were wrong. I don’t know why I bother with speculations. They are ALWAYS wrong. Anyway, I sat in a chair in the corner of the examining room and held him with the help of two veterinary technicians while the doctor numbed his cornea, turned out the lights and examined his eyes. Quig was pretty good about letting her do it, too. Eventually she determined that the speck of plant matter had probably been in there for over ten days. Thankfully it had not penetrated his cornea and she was able to brush it away with one of those little paper spears. After the administration of a few more drops and a treat for Quigley, we were on our way. We brought home a bag of three different types of eye-drops that we’re to continue administering multiple times a day. After he got home, before the numbing wore off, I went out and bought a new e-collar in case he started rubbing his eye later on when the numbness wore off. Well, day’s end is here and he’s not rubbed it once that I’ve seen. I love it. Nothing is ever what I expect it to be, it seems. And God knows that so well. Forget about expectations, He seems to be saying to me. And just trust me for however it’s going to turn out. 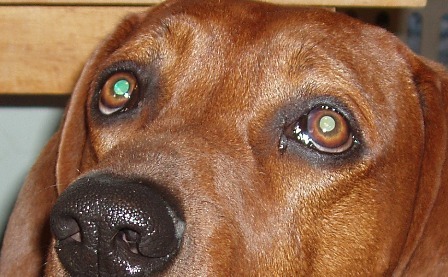 This entry was posted in Ailments, Photos, Quigley and tagged Ailments, Dogs on April 13, 2010 by Karen Hancock. For some reason this reminds me of something I read (I think in “The Shack”) that talked about why it’s so pointless to worry about the future, or try to fix the past: When we imagine the future, how often do we imagine it with Jesus there with us? Usually it’s all us on our own, and everything that can go wrong will. But when we LIVE it–in the present–Jesus is right there with us, and so it’s not awful, or insurmountable, and it can be downright miraculous. Anyway, that was the essence of the idea! It was certainly a truth I have to remind myself of continually! Phew! Been there, done that! I have to work on shutting down those thoughts pretty quickly–usually with a quick prayer 🙂 ! Glad the big boy is okay. Hate it when our doggies are hurting. Grace all the way!!! So glad he’s okay! We’ve had a lot of wind this spring too and I never even thought of something like this happening to our 2 retrievers. Ouch! This reminds me of my experience with “expectations”. We were making arrangements to take my 81 year old sister-in-law to an Alziemer facility near our home which was 4 hours away from hers. She had always had a dog, and “Taffy” was the latest, having been by her side for several years. Of course, my fear was that she would “have a fit” over leaving her behind. As it turned out, she asked about her several times on the trip and I assured her that Taffy would be just fine “at home”. This “home” would be with a friend. After about 30 minutes from our destination, we stopped for a bite to eat. She did not mention her dog, ever again, to me or to the attendants at her new home. She fell recently, required surgery and died on Easter morning. It was at the hospital, when she was being given her final shot of antibiotics, while I was holding her hands, that I heard her say, most distinctly, “Quit Taffy”. And I was so concerned over how she would react to leaving Taffy behind. My expectations were pointless. God’s grace prevailed.